All-Inclusive cost with ALL flights per person: From $6,595. This will be our LAST Patagonia Hiking Adventure season. All-inclusive prices include international flights from Los Angeles and ALL flights in Patagonia, ground transportation in Chile and Argentina; hotels, shelters; and all meals. See details in the itinerary. Without a doubt the best value in a Patagonia trekking adventure. Before making your reservations with another company download and print our What's Included Checklist and compare! See our FAQ and the detailed itinerary for complete information. The Patagonia hiking adventure combines trails in three National Parks — Torres del Paine National Park, Los Glaciares National Park, and Tierra del Fuego National Park. We begin our Patagonia hiking adventure in Torres del Paine National Park in Chile (UNESCO World Heritage site since1979), where we will hike to its renowned towers and horns. 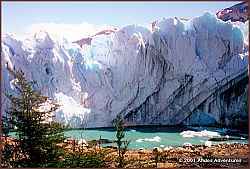 We drive across the border to Argentina and after a visit to the advancing Perito Moreno Glacier, we continue in Los Glaciares National Park in Argentina. 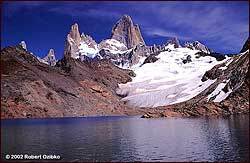 There we will enjoy views of the famous granite massifs of Fitzroy (11,289’) and Cerro Torre (10,265’). We fly farther south to continue our Patagonia hiking adventure in Tierra del Fuego National Park. Our adventure concludes with a visit to the cosmopolitan city of Buenos Aires. 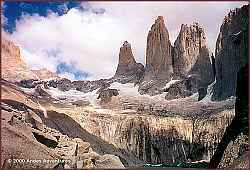 • Hike to the base of the Towers of Paine, and Cerro Torre, and Fitzroy. • Stay in fine hotels 11 nights and comfortable mountain lodges (refugios) 3 nights  no camping! This Patagonia Hiking Adventure explores three National Parks in Patagonia: Torres del Paine, Parque los Glaciares and Tierradel Fuego. Hikes are in mountainous terrain below 4,000 ft. Distances generally range from about 8 to 12 miles, with shorter options available on some days.